Hair Style & Beard Style Photo Editor is unique photo editor app which allows you to edit any face with different Hair style, beard style, mustache style & turban style. 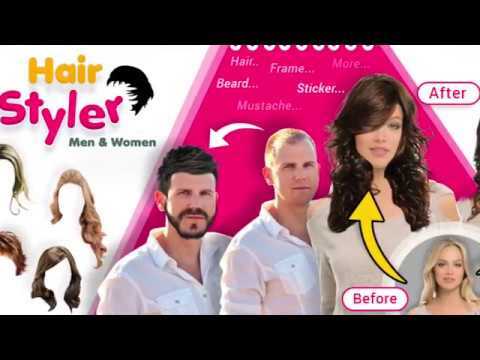 This is an easy to use photo editor tool where you can smoothly change Hair style, Beard Style & Mustache style of any face. Remember this app before embarking on your hair & beard growing journey try this app & see how your hair & beard will look like so you don’t get sidetracked. * Now your photo is ready with new look, you can easily share it with your friends, family members & social sites. Here are some of the features Hair Style & Beard Style Photo Editor App. Men Hair Style : Different type of latest Hair styles for men which looks really cool & make any face smart & dashing. Beard Style : What beard style works on your face shape ? Try this app, here you can check different type of Beard style on your face & grow your beard according to your face. Mustache Style : Mustache are a huge trend among guys & in this app we have gathered latest & best mustache style for you to take a look & try. Women Hair Style : From short to long, Latest Hair style for women. You are in the ideal zone for trying out different style of hair on your face. Download this amazing app Hair Style Photo Editor & enjoy. Stylish Turban : Amazing collection of Patiala Punjabi Turban & Rajasthani Turban. Select any turban of your choice & make your face smart & handsome with shahi turban. Fancy Sunglasses : Latest style of sunglasses for man & woman. You can try different type of sunglasses on your face & make your photo perfect with latest style sunglasses. Photo Collage : With this app you can create amazing collages using photo, background, background color, photo frames, stickers & text editor. With Photo Collage tool, you can create a multi photo collage, where you can put a number of images of your selection of different shapes and at different angle of your choice, and then just add a beautiful background pattern from the app and an amazing looking border frame to add some style to it. Image Editing Tool : With this tool you can edit the imported photo (from gallery or camera) and rotate, crop, zoom or move it until you're happy with it. The original photo won't be affected at all, this is a duplicate. Face changer app – It’s an extra advantage of this app. If you want to change your face look in your photo, download this app & edit your face with different type of man hair style, beard style, mustache style & turban style. Change your hair style, beard style & mustache style in just few seconds by using our app. It would be great if you download & use our Hair Style Photo Editor app. You will surely enjoy this app. Our goal is to help users have an enjoyable experience when using our apps & games. It would be great if you download & use our Hair Style & Beard Style Photo Editor App and write a review based on your experience with it. Hair Style & Beard Style Photo Editor is a fun app to make you laugh and It is only for entertainment purpose. Download & Enjoy it.